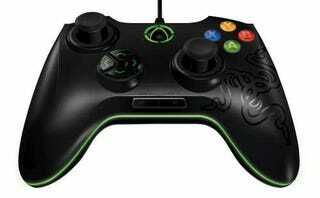 Razer's Onza control pad for the Xbox 360 sure looked nice when we saw it at CES earlier this year. Problem is, for some people, it's too nice. Major League Gaming has banned the pad from its competitive play, officials citing the fact the controller has two buttons that are too easy programmable. The big issue with extra buttons is how easy it is to mod the controller without us being able to monitor it. Modders will be able to turn the extra buttons into rapid fire buttons or a macro like RRX. We cannot simply check every player's Onza controller to make sure they have not modded it. Sure, someone could do that now with a Microsoft controller, but by doing that they are removing a default button on their controller. People pay a lot of money now for modded controllers with extra buttons that will rapid fire or macro. The Onza would make it impossible for us to monitor this on the circuit. Wait, people still buy controllers with macro buttons? What is this, 1993? Just push the things manually, like your daddy had to.